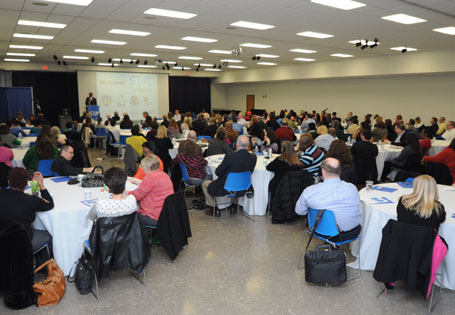 The Fifth Annual St. Louis Alliance for Reentry (STAR) Summit welcomed more than 200 area reentry experts to discuss "Lessons From the Field" on March 12, 2014 at St. Louis Community College - Florissant Valley. Senior Fellow for the Justice Policy Center at The Urban Institute Shelli B. Rossman spoke about effective responses to offenders and families as part of the keynote address. In addition, information was provided by City of St. Louis Mayor's Chief of Staff Jeff Rainford, St. Louis County Executive Charlie Dooley, and ARCHS' Chief Executive Officer Wendell E. Kimbrough. The afternoon featured a presentation by Diversion Progam Manager for the U.S. Department of Justice Scott Collier on The Impact of Prescription & Designer Drugs on Reentry, and two panel discussions on Veterans & Reentry and Housing & Reentry. The annual Summit is sponsored by ARCHS, Lutheran Foundation of St. Louis, Missouri Department of Corrections, St. Louis Community College, Washington University in St. Louis, St. Louis City, and St. Louis County. Registration is open for the STAR Summit, which will be held from 8 a.m. to 4 p.m. on Wednesday, March 12, 2014 at St. Louis Community College at Florissant Valley Student Center (3400 Pershall Road, St. Louis, 63135). The theme for this year's Summit is "Lessons from the Field." $15 registration fee includes lunch. A keynote address will be given by Shelli B. Rossman, who is a Senior Fellow for the Justice Policy Center at The Urban Institute. Special reentry topics include Drugs, Veterans, and Housing. Mark your calendars for the second Saturday in December and join Manasseh Ministry for a special evening to celebrate and recognize ex-offenders making positive change in their lifestyles and communities. The EX-MAD 7th Annual Scholarship and Recognition Banquet will be held at 6 p.m. on December 14, 2013 at the New Northside Banquet Center (5959 Goodfellow, St. Louis). The event will feature dinner, dancing, and speaker Dr. Marc Lamont Hill. Shawndrea Thomas will serve as the Mistress of Ceremonies, while Kim Hudson will be the Awards Presenter and X Blue Rayne will serve as the Poet Author Speaker. Tickets available at www.manassehministry.com or by calling Rev. Jackson at 314-732-7340. The 2013 Missouri Reentry Conference will held November 20-22 at Tan-Tar-A Resort at Osage Beach. The Conference's theme this year is "Reentry in Action." The annual Conference provides high-quality education and networking opportunities for corrections professionals and community-based partners who contribute to the prisoner reentry process. The multiple tracks format offers a self-directed, facilitated learning environment with education sessions, interactive forums, and exhibits. Education sessions are carefully designed to transcend all industry sectors, focusing on current and emerging issues, best practices, and the many challenges that the community, corrections staffs, and ex-offenders face. This year's keynote speakers are Dean Schardan (convicted felon turned stand-up comedian) and Dr. Fred Rottnek (Medical Director for Corrections Medicine for the Saint Louis County Department of Health and Associate Professor at Saint Louis University). The annual Conference is sponsored by Area Resources for Community and Human Services (ARCHS), Missouri Department of Corrections, Missouri Department of Social Services, and Family and Community Trust (FACT). More than 400 people attended last year's Conference. Onlilne registration is now closed. On-site registrations will be available at the conference. $62.14 guest room special Tan-Tar-A room rate per person, per night. One bedroom suite ($105.83) and two bedroom suite ($164.08) options also available. Check-in available at 4 p.m., while the check-out time is 11 a.m. Discounted room rates will be honored through Monday, October 21. Make reservations by calling 1-800-826-8272, or by clicking the link below. Ask for the "mdoc" room rate or type it in as the Group ID if registering online. Register for STAR's "Working with Women Offenders Workshop"
Register below for STAR's latest professional development offering - "Working with Women Offenders Workshop." The interactive discussion will be from 8 a.m. to noon on Thursday, October 24, 2013 at the St. Louis Community College: William J. Harrison Education Center (3140 Cass Avenue, St. Louis 63106). Panel discussion to include topics on human trafficking, job training models, addressing trauma, transitional housing, and women’s risk needs assessments. This event qualifies for (4.0) Contact Hours. Certificates of attendance will be provided to each attendee. These events offering great learning and networking opportunities for anyone serving the ex-offender population.